The legend of las mariposas--the beautiful monarch butterflies that every year fly more than two thousand miles on fragile wings to return to their winter home in Mexico--is Luz Avila's birthright. She learned of their ways and their mystical powers from the grandmother who was the only family she ever knew. Now it is her turn, like the butterflies, to make that long, perilous journey. In order to honor a promise to her beloved abuela, Luz must return her grandmother's ashes to her ancestral village in the mountains of Mexico. But while this ofrenda, a tradition so old its origins are lost in the mists of time, will mean leaving behind a man who loves Luz deeply, the journey promises to bring deep spiritual meaning to the life of a woman who cannot find her way into the future until she comes to terms with the past. As Luz slowly makes her way south from blustery Milwaukee in a VW Bug so ancient it has no business on the highway, a series of seemingly random encounters touches her life: a desperate mother-to-be, even younger than her, fleeing an abusive lover. An anywhere-the-wind-blows free spirit. 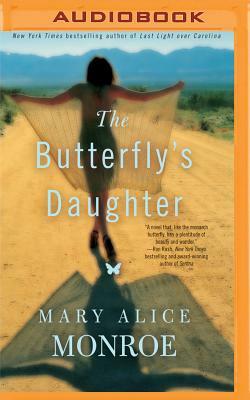 A lonely career woman who is determined to live, really live, for the first time. It is in San Antonio, however, that a truly startling revelation awaits Luz: a reunion with a shadowy figure from her childhood. Together, they cross the border into Mexico, but they also must somehow cross the border that separates past from present, bitterness from love, and truth from lies. They will honor the memory of another beloved woman by standing in the Sacred Circle to witness the spectacular, glittering river of orange monarchs descend from the sky to return home. If they can share in this age-old ritual, perhaps they will be able to find their way back to love, and take their place in the enduring cycle of life.